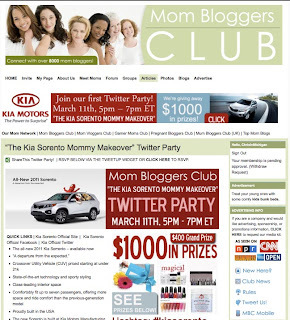 Kia threw a Twitter Party for the Mommy Bloggers Club last night. The Kia Sorento is building off their Super Bowl family-oriented TV ad that featured several kid toys including a Yo Gabba Gabba character Muno, a Sock Monkey and couple other random plush toys. It was personally one of my favorite TV ads from the Super Bowl. The event was fairly well received especially by the women who participated. The “party” was basically a Kia Sorento trivia quiz with several prizes award randomly to those who answered the questions correctly during the allotted time. Questions focused on the Sorento vehicle and knowledge of the popular Super Bowl ad played into the quiz as well. 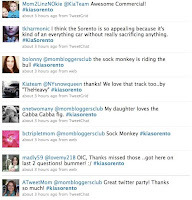 Determining if the Twitter Party with the Mommy Bloggers Club was successful is a bit difficult without knowing the goals established by the marketing team. There were about 40-50 unique people who participated; though, there really isn’t a baseline to understand if this Twitter contest performed well. Engagement was high but that was by design as people were answering quiz questions to win a prize. There were a few comments where people expressed their love for the Sorento ad or the vehicle. Reach is always an interesting thing. I pulled some random profiles from those who participated and most of the women had decent Twitter followings and even some good engagement metrics when analyzed against the stats provided by the website Klout. The good news is that Kia definitely reached their target by having the Mommy Bloggers Club promote and co-host the event. Many also feel in the Twitter community that this kind of contest turns the people one is following into spammers. So there are some negative side effects too when considering this tactic. I personally feel it is pretty much pointless spam banter for the followers not participating or caring about the “party” going on, but this is the case with many hashtag campaigns. One campaign recently held by a major automaker caused me to temporarily unfollow several people because it was becoming very annoying seeing twenty of the same messages getting retweeted every 10 minutes. Fortunately, there is a tool called TwitterSnooze to turn this stuff off for people not interested in such Twitter noise. Brands definitely need to be aware of the impact of such tactics. The good thing about Kia’s approach is it only lasted a couple hours instead of multiple days like other hashtag events. Kia definitely raised some awareness about their brand and found a fun way to extend their popular Super Bowl commercial to an online, social media adept crowd who definitely seemed impressed with Kia’s effort. Overall, I’d say for a Twitter contest this one was managed effectively and was brief enough to not be a considerable annoyance that can lead to negative brand sentiment.